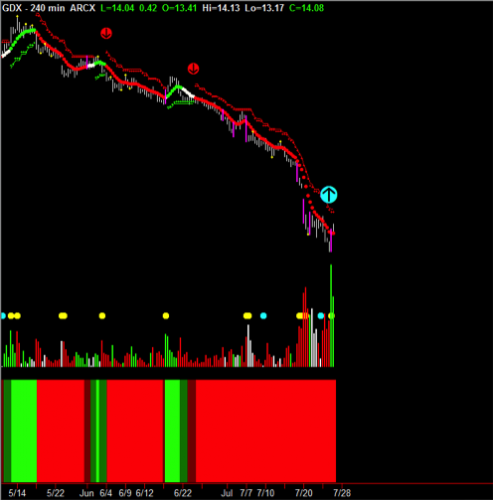 In today’s article, let’s take a look at how to trade Forex based on Hawkeye volume-based trading principles. And in particular, let’s consider the case where we missed the initial entry and are looking to re-enter an existing trend a little later. In Forex, we always begin with the Hawkeye Fatman indicator. 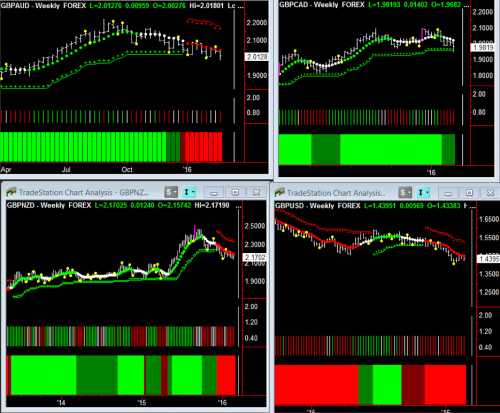 It shows which currencies are relatively strong or weak with respect to all the other currencies. Below is a chart of today’s Fatman showing that the EUR is weak and the USD is strong. Based on this setup, we know that strength cycles constantly, and usually returns to fair value or to the opposite extreme. 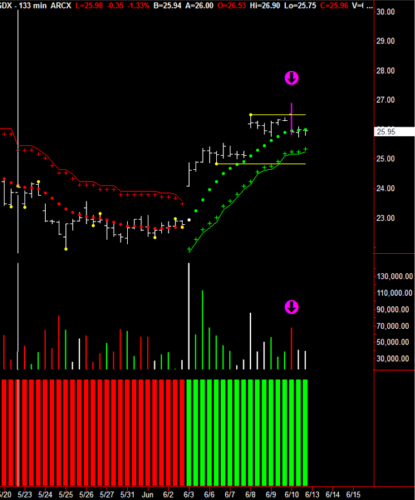 So in our charts, we look for a probable reversal of trend direction to start our trade. So the Fatman started to show a reversal setup around 0600, and we saw that the initial trade entry on our charts came around 0630, meaning we missed that initial entry! Bummer! What do we do? In our Hawkeye training room, we teach students to study VOLUME, and that is where we find our answer. 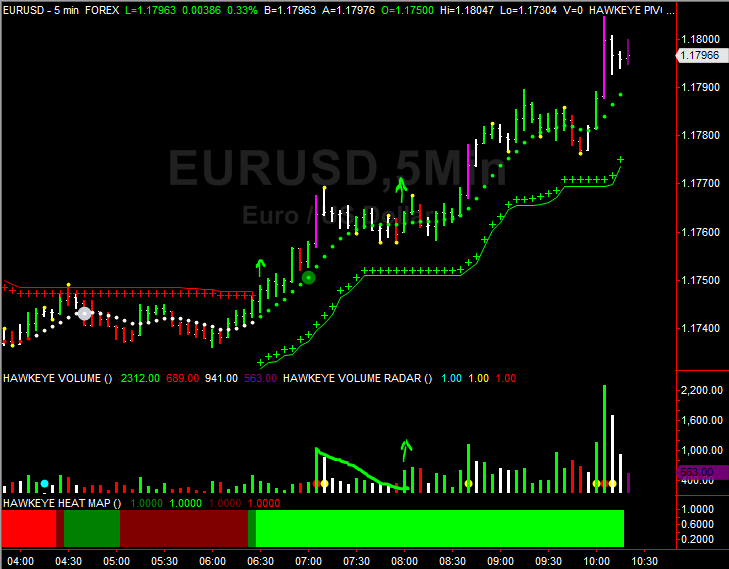 On the EURUSD chart below, we see the initial entry we missed, marked by the first green up-arrow. Since we missed the initial entry, all we need to do is wait for the pull back on the volume, which signifies buying weakness. 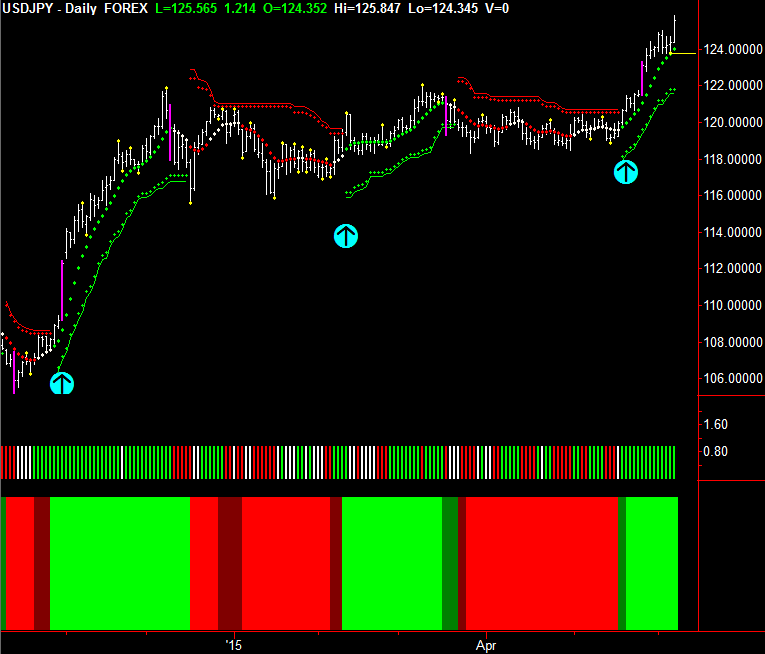 When buying strength returns, the trend continues and signals our re-entry. As you can see, there are several more opportunities to get into this trend if you missed any of the other previous entries. As an advanced tip, use the Hawkeye Roadkill indicator. 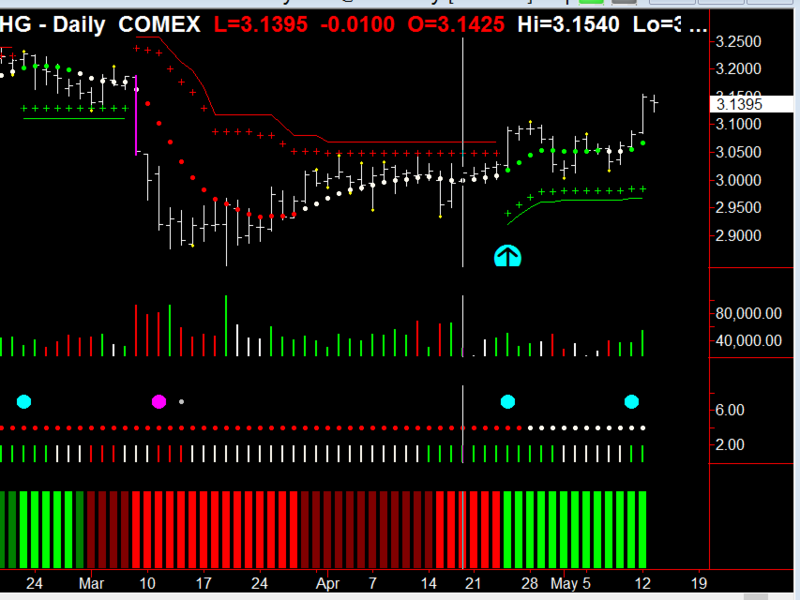 It identifies EVERY volume pull back on a trend, compares it to the longer time volume and signals the best time to enter or re-enter the existing trend. It is a fabulous tool that I would not trade without. But I wanted to make sure you knew how to spot a valid re-entry by just using volume. I teach this and many other principles in our weekly Wednesday training room. So please come along and join the action. 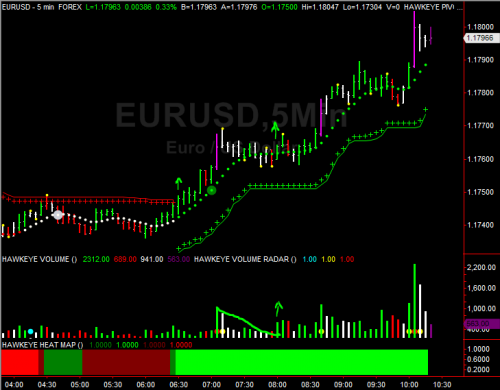 Join me in the next free LIVE Hawkeye Demonstration Room held every Wednesday at 9.30am EST US. 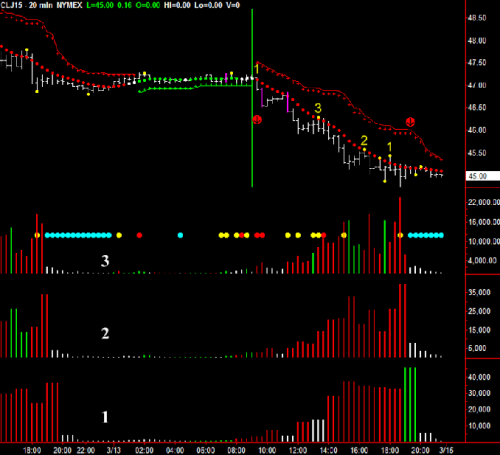 You will learn more about volume and volume price analysis and see more examples and live trade setups. It is open to all. Click this link for more information or to join us in class. 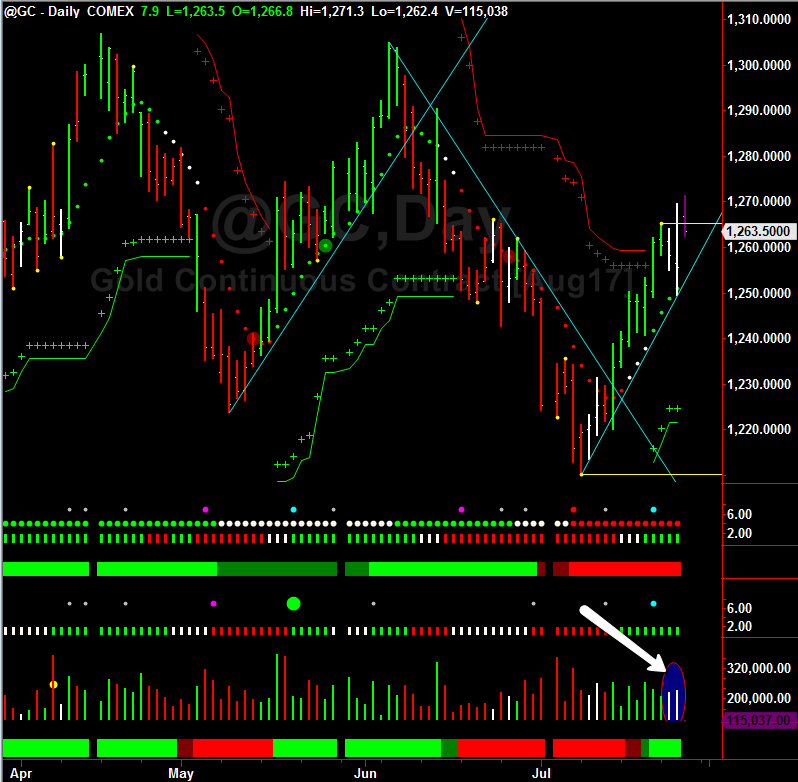 Last week we saw monthly Gold (GC) hitting a critical monthly trendline, as shown by the chart below. This trendline in Gold has been in place since 2011. 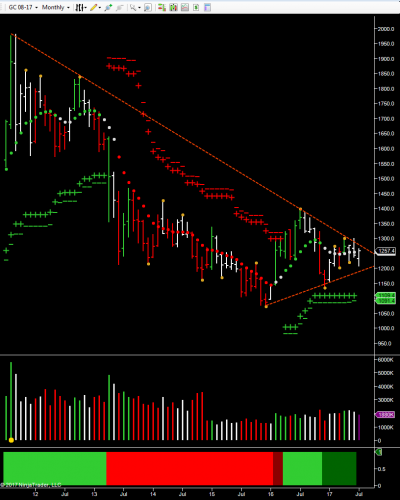 Historically, whenever Gold hits this trendline and fails to break it, the downtrend continues. 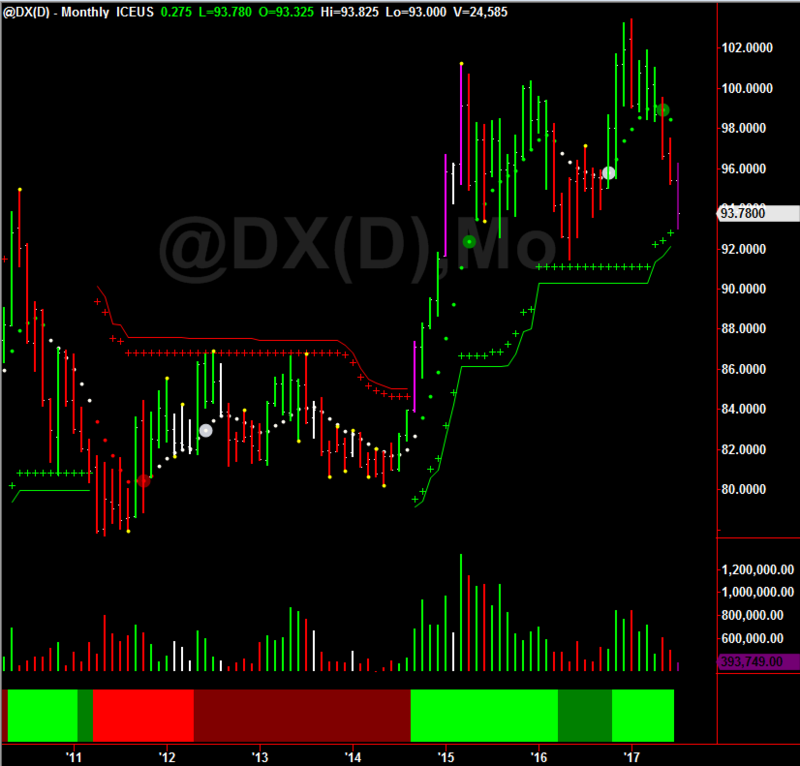 If we couple that with the US Dollar index (DX), the DX monthly chart below shows the current trend of weakness in the US Dollar. 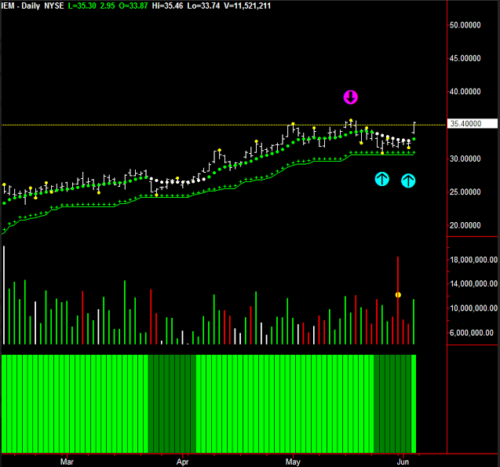 However, we see this trend hitting support, with declining volume. If the DX were to continue lower, we need to see volume advancing, not declining. Also, the Hawkeye Fatboy chart below shows that daily Gold is overbought and should start to lose strength, as it cycles back to fair value. This will be accelerated if the US Dollar starts to strengthen, and then Gold will begin to resume its longterm downtrend. 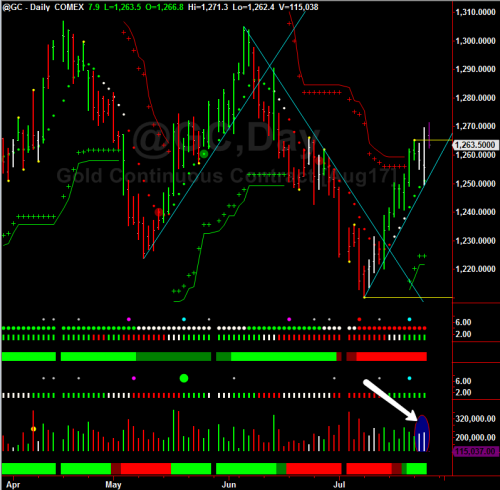 Looking at the daily Gold chart below, notice the volume weakness already beginning. 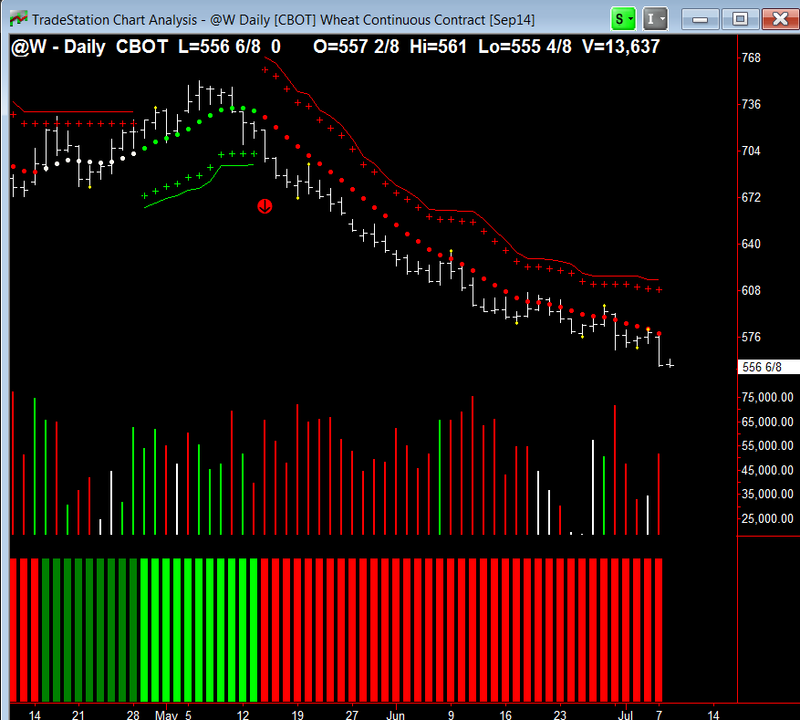 Therefore, watch the daily GC chart for the current uptrend to be broken, with confirming selling volume. Hawkeye Perspective: Gold is at a critical point now, so watch for the daily Volume on Gold to see if strength or weakness will prevail during this time. 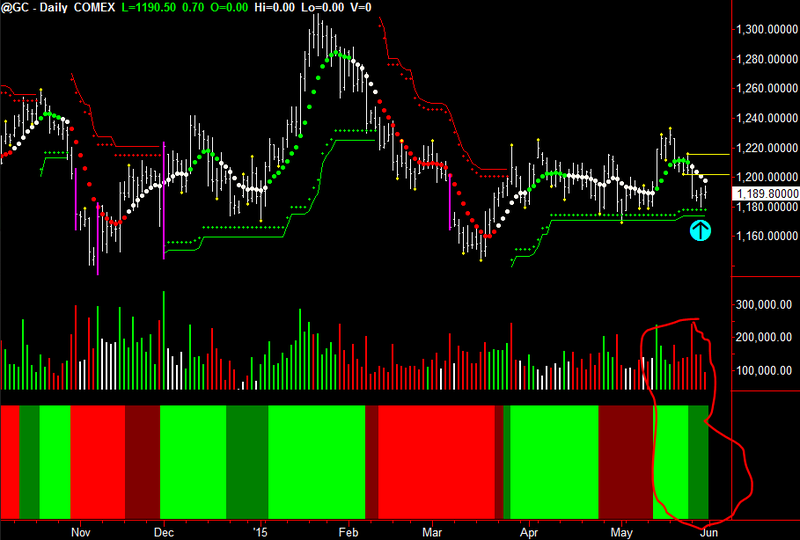 Remember, green buying volume shows strength, and red selling volume shows weakness. 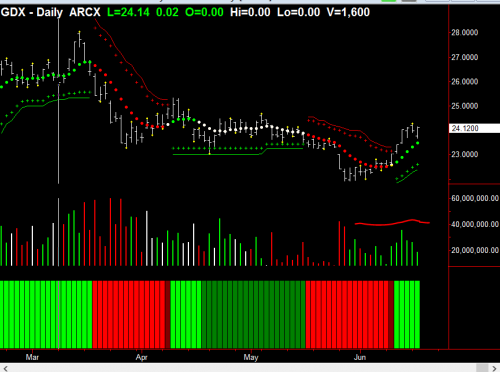 If the US Dollar starts to strengthen, this will accelerate the potential for a down move in Gold. Here is a common mistake that rookies make. This is the daily gold chart, but it applies to all markets and all time frames. A Hawkeye Pivot is formed at the yellow arrow. 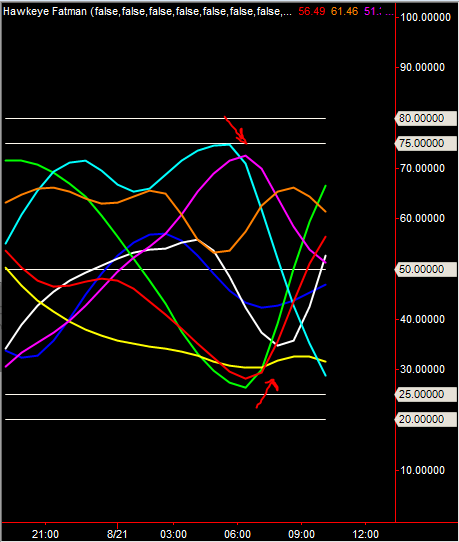 Most rookie traders will draw a line off the high (the blue line). You need to draw a line off the low of the bar as well (the yellow line). If it was just off the high of the bar then it was only touched twice. BUT off the low it was hit eight times. So now you understand that this is a major resistance area. BY DOING THIS YOU HAVE INCREASED HOW YOU PERCEIVE THIS AREA BY A FACTOR OF FOUR. As you know I have been bullish on gold since mid-December and closed out my long positions last week and am waiting for a pullback and a re-entry. What made me want to close my position? I’m showing you two charts and this technique can work on any multiple timeframes that you might be trading. You can see at the end of February the Hawkeye Volume turned green, Heatmap dark red and there was also a Hawkeye Pivot two bars previously, indicating that we will have 3,5,7 bar reaction from this point. 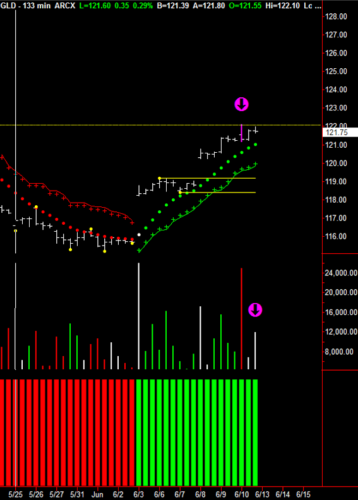 The magenta arrow shows the red Volume has entered the market. This coincided with exactly the same point on the daily chart as the monthly chart when the price stalled at the monthly Hawkeye stops. I have placed a dotted yellow line and also a down magenta arrow where this took place. Strategy for the upcoming week – I now want to see the daily finding support at the daily stop level and reverse to the upside in harmony with the weekly and the 133-minute chart. And when the monthly stops are broken this market will truly be on its way. You can use this method on any instrument you might be trading and any multiple time frame. I will be teaching this at the upcoming April online webinar and encourage you all to come and register to really learn how to drive the Hawkeye engine. As long as you register you will receive the recorded webinar so you don’t have to be actually present to benefit from this education. There is fundamental news over the next week on the GBP as the UK tries to negotiate a better package with its membership of Europe, which will result in an in/out referendum. 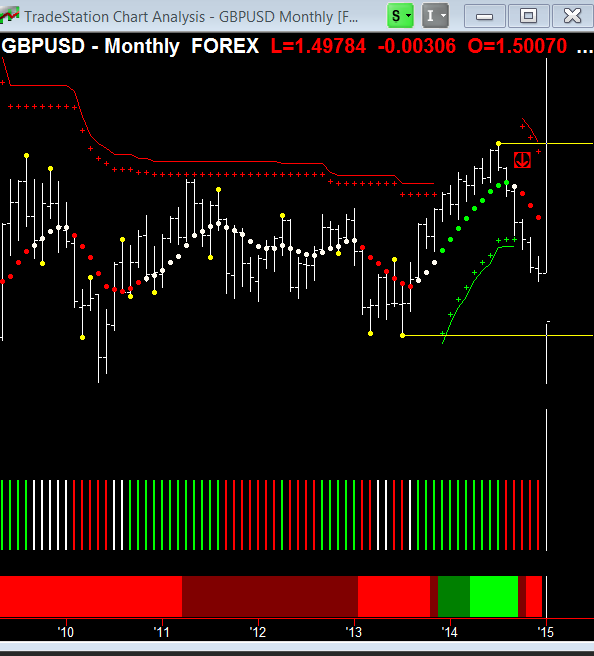 The markets don’t like uncertainty so there will be many fabulous opportunities to trade the GBP FX Pairs. All are exhibiting a downtrend and the magenta arrow on the daily Fatman shows there is still some way to go. All are at critical support levels and this coming week will show if this support holds. 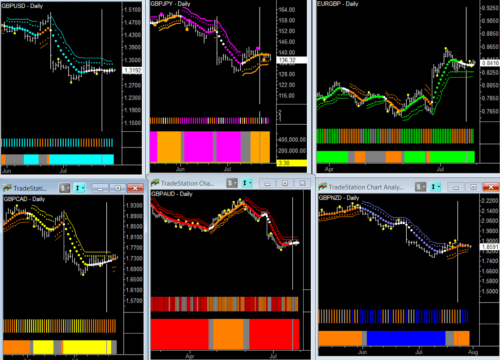 All Pairs except the GBPCAD are in downtrend with little support below. 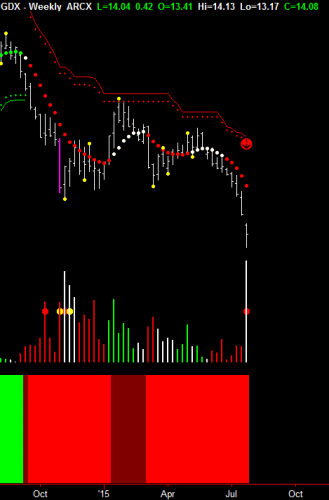 The cyan arrow on the Fatman shows oversold. 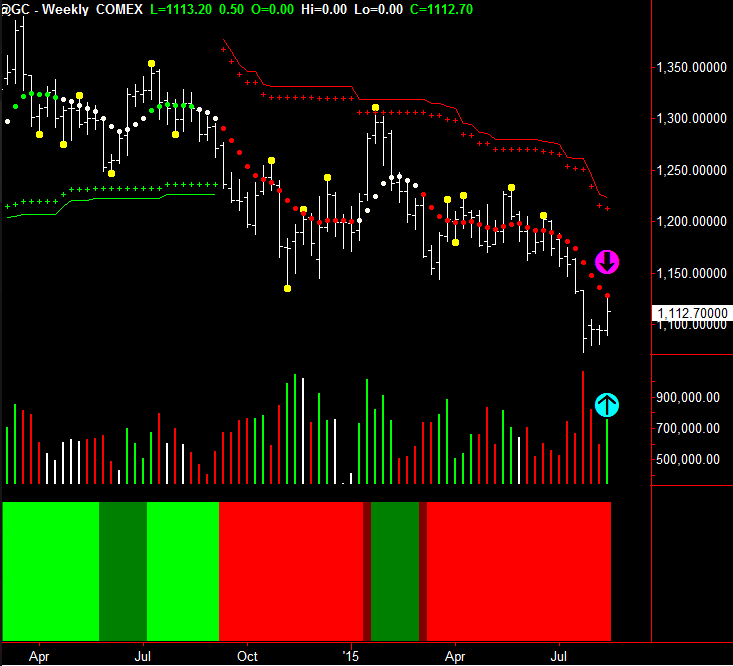 But with the daily Fatman still in downtrend the weekly could stay down here for some time. 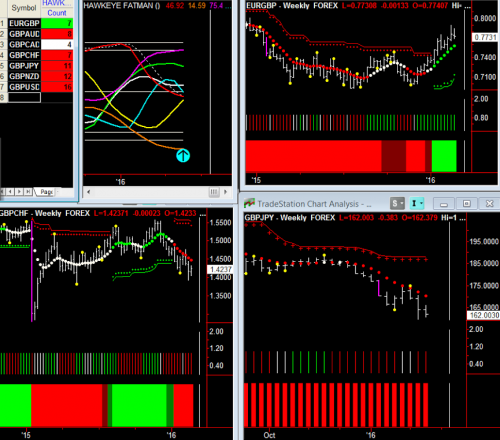 Go and look at the lower time frames i.e. 30 minutes, and only take shorts. Regardless of production cuts, or what is said at the next OPEC meeting, crude oil is still in a strong downtrend. You can see whatever positive news props the market up for a day or two is quickly met with sellers. The market has not had more than three positive days in a row in well over a year. Rallies should be viewed as selling opportunities. When a market has been in a downtrend for this long it is not going to turn around quickly. It is going to take much more than one country cutting production to put a bottom in crude. Market Update. Not Too Late For Gold? Yesterday buyers stepped in as the second half of the trading day developed. This can be interpreted in two ways. First, as profit-taking ahead of the long weekend, which is normal. Second, that the market tried twice to break lower and failed. As far as technical analysis goes, 80% of breakouts fail at the first attempt. So next week will confirm if this is indeed the start of a bounce. For those who follow my Newsletter, you know that prior to Christmas, I went bullish on Gold and chose NEM Newmont Mining as my preferred stock to trade this move. Lets look at the charts. A low-risk entry at the end of 2015 when the 133-minute chart clicked into the upside. I was stopped out on February 25, but will reenter if last week’s high is taken out by a close. After such a strong move lower, the odds of some sideways trading action is very high. Markets don’t just fall off the chart; they run, then consolidate, then run again. I believe we are in the beginning of a consolidation period. I always preach that you are trading risk rather than a market and the example below highlights just that. Look at the slowest time frame (bottom left). The Heat Map on the bottom stayed red, both bright and dark, throughout the whole day, indicating the bias was to the downside. 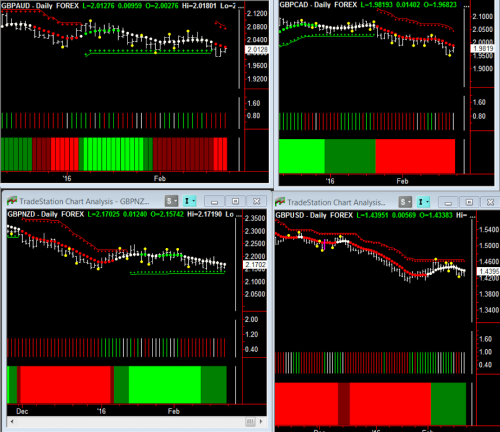 The other two time frames, especially the faster (on the right hand side), gave buy signals. But they were not elected as the slow time frame indicated too much risk. Using triple time frame entries filters the potentially negative trades and ALWAYS keeps you the right side of the market. 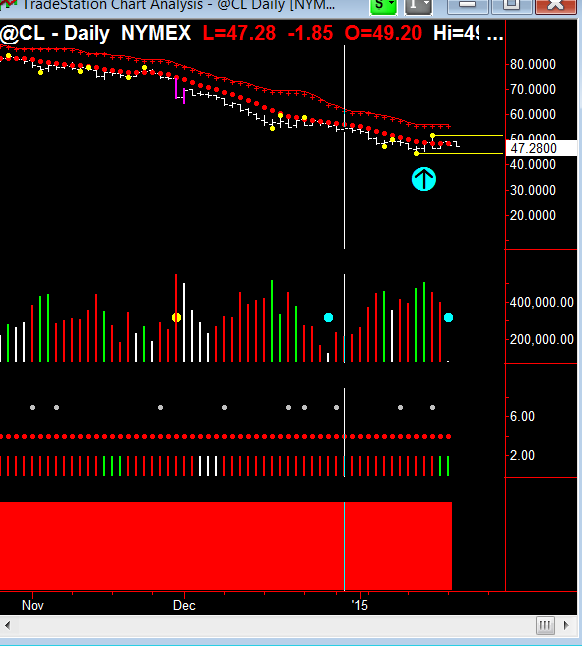 The Crude market is showing weakness in all time frames. If you were using Hawkeye, your positions would be extremely profitable. So let’s go and do our volume analysis using our Hawkeye tools. As you can see, price was rejected by the Hawkeye Zones, and where I have placed the magenta arrow shows Hawkeye Volume indicating selling for the last two months. 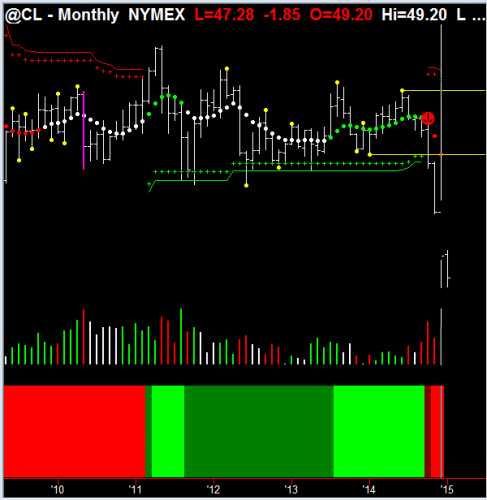 Great signs of crude oil weakness are evident. 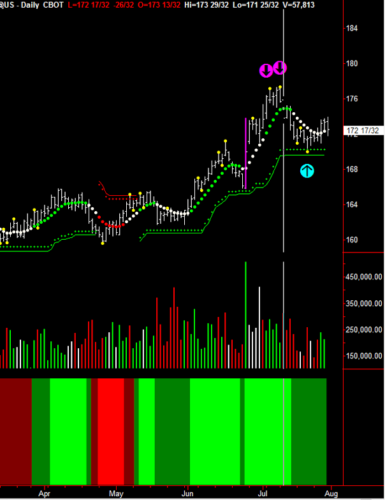 The magenta arrow shows selling last week. The trend is down, and the bottom of the Zone at 38.50 is the next area of resistance. Again, great signs of crude oil weakness. The story unfolds. For the last seven days sell/no-demand Volume has been dominant, and where the magenta arrow is you can see the red Trend dot has broken out of congestion to the downside. All time frames are short. The weekly bottom of Zone at 38.50 must hold or the market will be in serious danger of free fall. These are all great signs of crude oil weakness. Gold mining stocks have been getting slammed lately, and the exchange-traded funds that track them are feeling the pain. So, this week, I’ll be talking about GDX (which is the Market Vectors Gold Minors ETF), and showing you how to make great money using Hawkeye Volume Based Indicators. 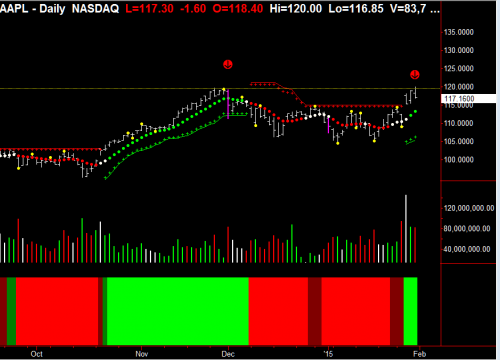 Let us begin by looking at the weekly chart. 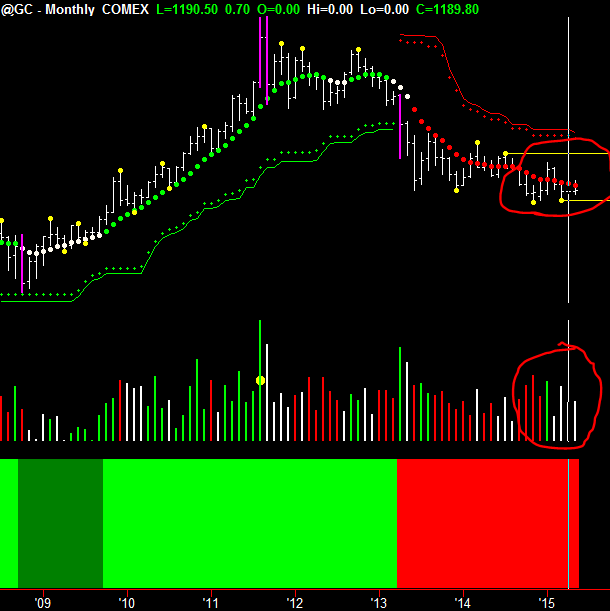 On the weekly GDX, you can see that we have had very high volume lately. In fact, notice the high volume bar that came in with a red dot on it. 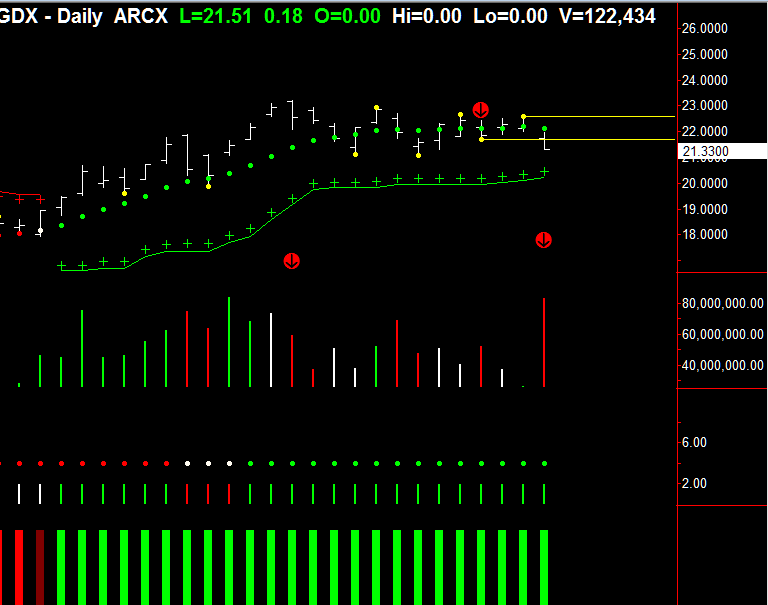 That’s the Hawkeye Volume Radar, which tells us that we’ve just had an ultra-high volume week. 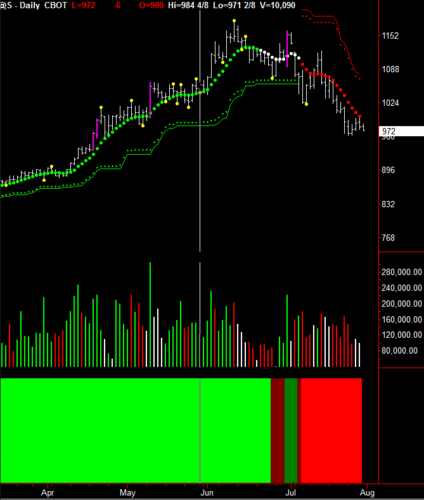 If you look prior to that, we had pretty low volumes going through, so we painted the Hawkeye Volume as a white bar. The reason for this is both because of the price action and because we had a gap down (see the red arrow on the chart above). 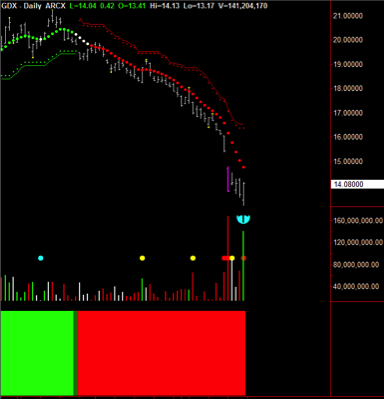 Now, if the close was a little bit higher, then the Hawkeye Volume would have turned green. But, it didn’t. It is showing you that there is no demand. In other words, the selling pressure has been taken off. 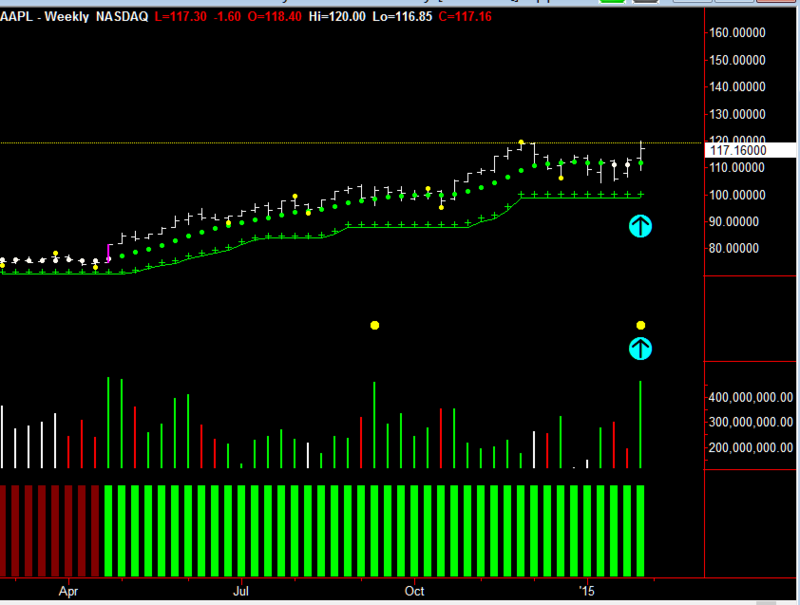 Although it gapped down, it rallied back up during the week. So, this coming week is going to be very interesting, because if we get a week that puts in a Hawkeye Pivot (an isolated low on the bar with the red arrow which we won’t know until the end of this coming week), we will expect a 3-5-7 bar reaction in an up move. So again, be very careful. You can trade the up move which might be quite violent, but the overall bias is down. It could be just a bear bounce. 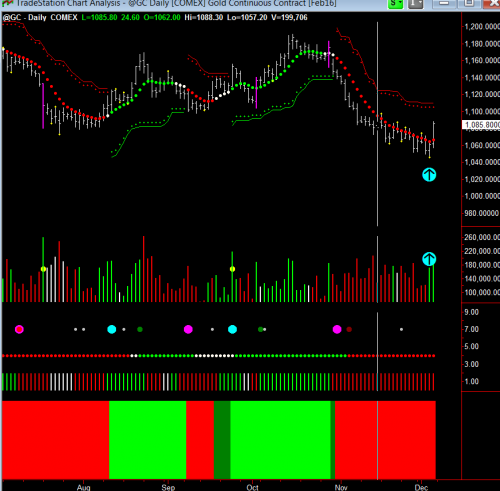 If we now go on and look at the daily you can see the story unfold a little bit further. 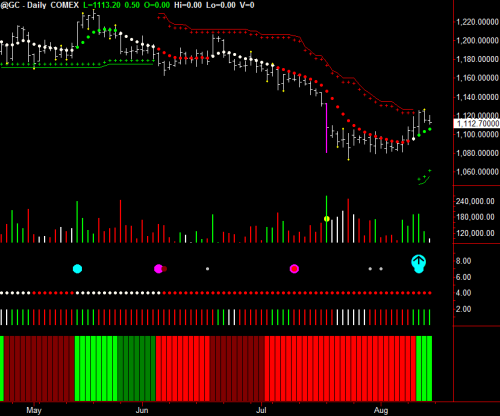 Again, if we look at the Hawkeye Volume bar on the GDX, it’s green with a red dot on it showing that it was ultra-high volume. 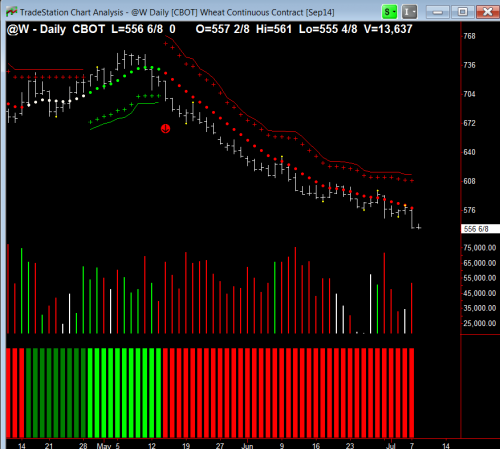 That is confirming the no-demand of the weekly, and that we expect the bias to be up this coming week. You can also see that, providing that the low of Friday is not taken out on Monday, we will also put in a pivot low which will also give us a 3-5-7 bar reaction in this up trend. 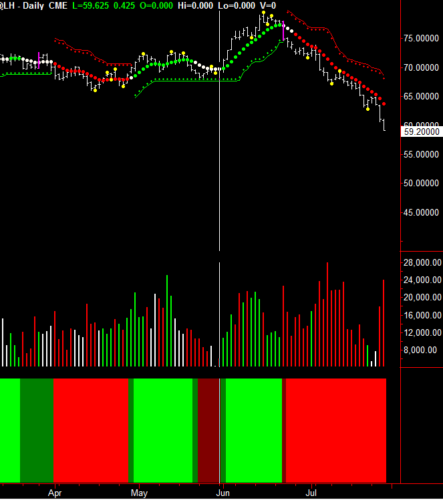 So, we can quiet easily see it start moving up around to the trend dot value or higher. And then, if we go over to the 240 minute, it all becomes a little bit clearer, because on the 240 minute you can see you had two opportunities in that down trend (where I placed the red arrows) to get into this trend down if you missed it. 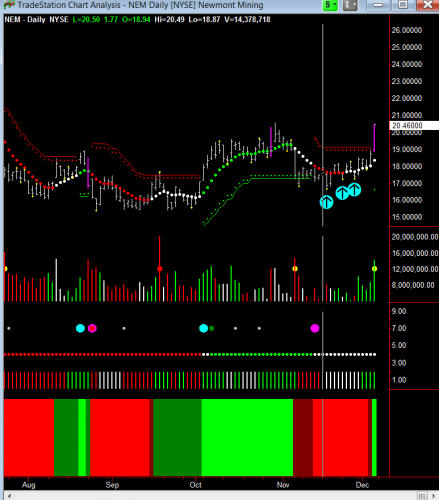 But then, if you look right at the live edge of the market, we have two volume bars that are green, showing us that the volume has come in. 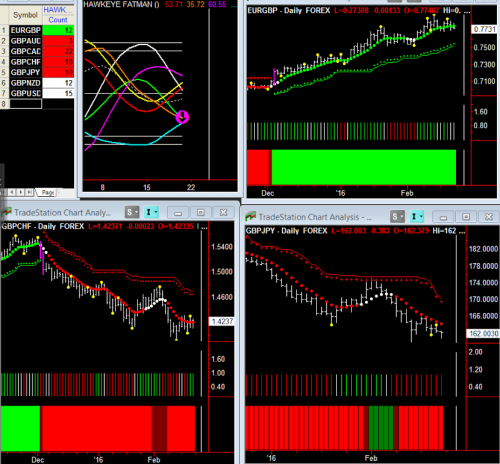 We have a wide ranging bar that’s come in, and everything is set up here to confirm the daily time frame. So, it is leading the way to show that this should be pushed up next week. So, keep an eye on it. 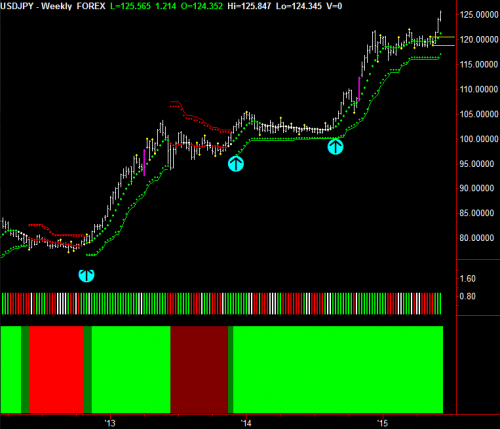 If you are trading the Forex, remember that you can trade XAUUSD. So, we have a very interesting week coming up. We could see quite an interesting rally coming up on the faster time frames taking this up to test itself before it will probably revert back into its downward trend. How Hawkeye Makes Trading The Yen So Easy And Profitable! 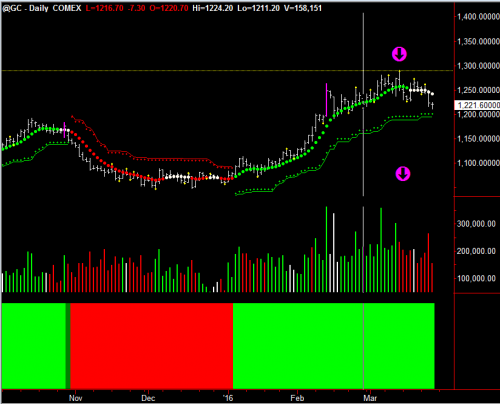 Today, I will analyse the Yen with the use of my Hawkeye indicators. Interestingly, the Yen has recently broken out of a six month trading range on the monthly chart. Also, the fundamentals are that the Japanese economy is fighting deflation. So, they will continue to try and push their currency lower until this deflation is completely out of their system. If we look at the monthly chart, you can see from the beginning of 2012, where the green dots came in, it’s been in an uptrend. In other words, the Japanese Yen has been weak, and the US dollar has been strong. 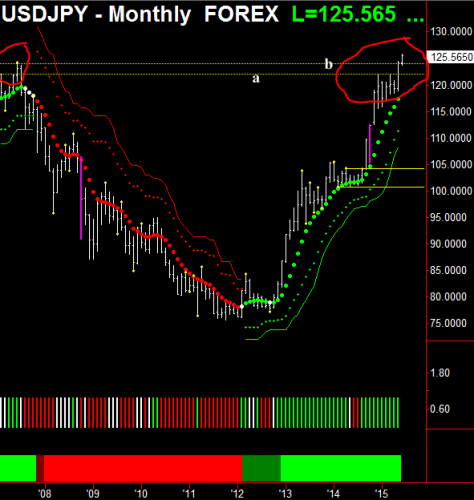 The USDJPY pair has gone from about 75 to over 125, which is a huge run. But more importantly, look at the dotted lines I have put on the chart. The dotted line marked a is drawn off the high of six months ago. 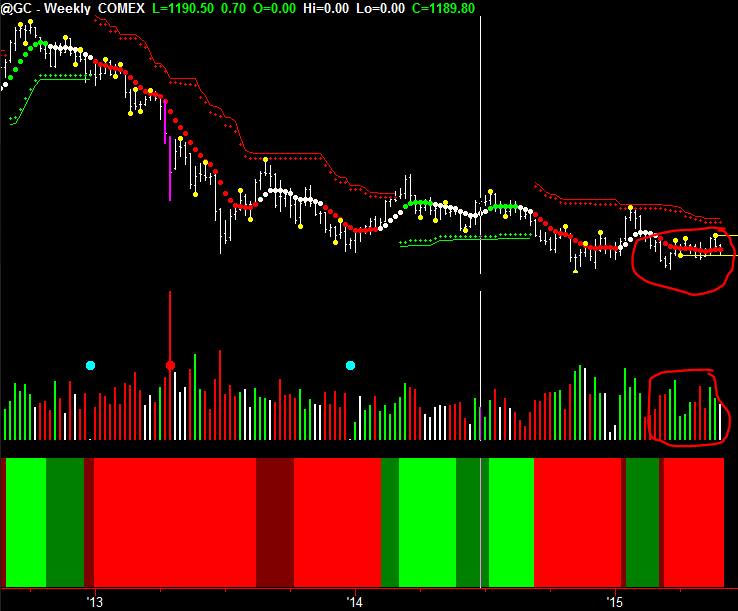 And you can see that it consolidated for the period I have marked with a red circle. Also, you can see at the line marked b, it has broken out of that consolidation heading up past the high in 2007 (which is circled in a red over on the left hand side). So, it looks again that this currency is going to break out to the upside. So, whatever you do, do not even begin to consider going short at this point! 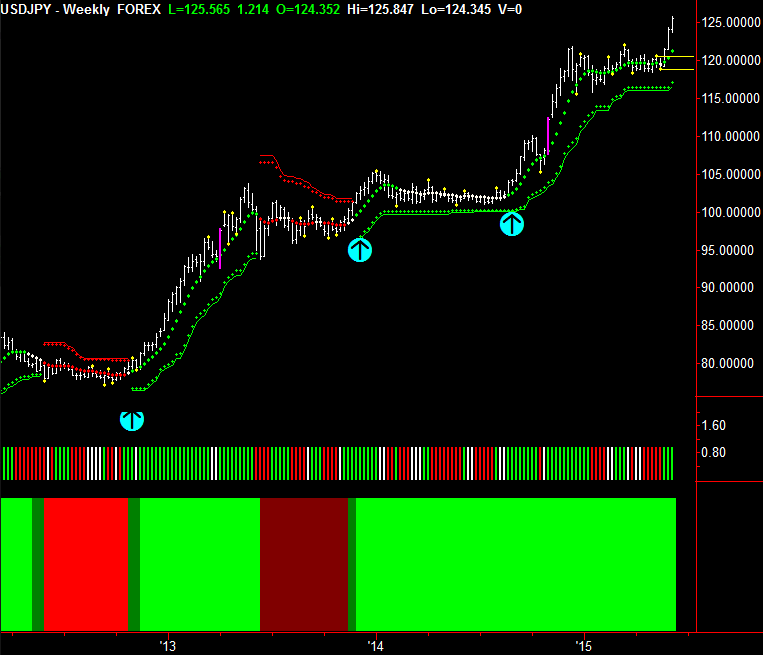 Now, let us have a look at the weekly chart. First off, notice how I’ve I placed three cyan arrows to mark various great entry points. Frankly, I could have placed five or six, because the uptrend continued on the monthly. So, if you simply bought the dips on the weekly, you would make substantial profits all the way up to where we are now. Without a doubt, there’s been easy money to be had in this pair. Finally, let’s take a look at the daily chart. Of course, since the daily chart is a faster time frame than the weekly, it gets a bit more choppy. 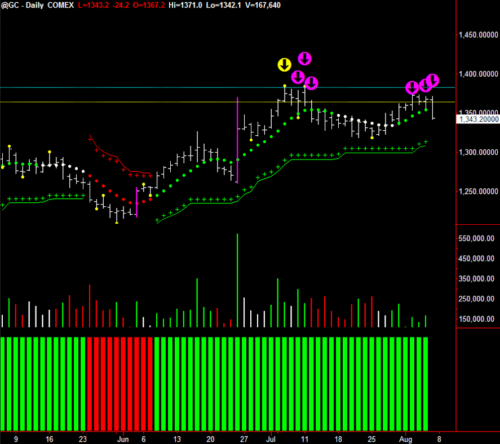 But, yet again, I’ve marked three great opportunities to get long in this market with the cyan arrows. So, definitely consider buying the dips, and don’t go short until Hawkeye specifically tells you to. And just as an aside, PLEASE try to trade the longer time frames. For example, the daily, and if possible, even the weekly. Unfortunately, most Hawkeye traders try to trade the faster time frames. However, the money is not there. The money is in the longer hauls. That’s where the hedge funds are, and that’s where you should be. In this week’s newsletter, I will consider two different instruments. 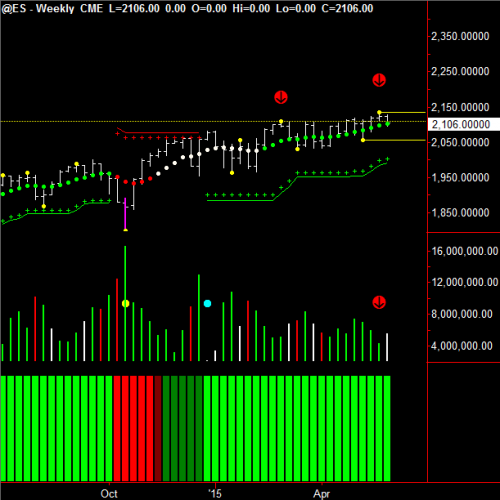 First, I will revisit the E-mini weekly since I have been discussing it in the last few newsletters. Then, I will do a more in-depth look at gold. Okay so let’s start with the weekly chart of the E-mini. First, notice how I have placed three red arrows on the chart. Let’s begin with the red arrow on the left hand side. Now, over the last few weeks, I have been saying it is paramount that this level is taken out with the bar, where no part of the bar closes on that dotted line. You could have been easily suckered into this, because on the second arrow on the top, you can see that the price has come out of the dotted line and no part of the bar touched it. So, you could easily start to think we are on a breakout to the upside. 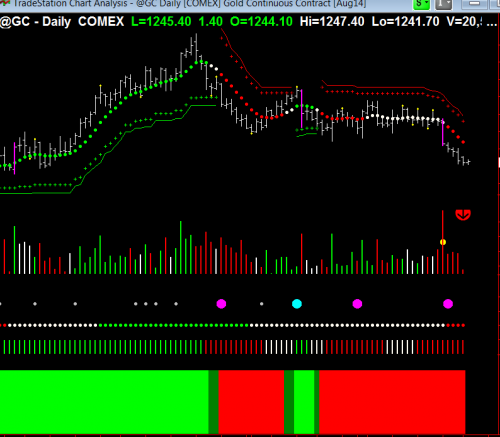 However, if you look down below (where I placed a red arrow on the volume), you can see that the bar that broke out had declining volume. Now volume, as we all know, is the gas that powers the car. And, if there isn’t enough gas in the tank, the car will slow down. And that’s exactly what happened here. So, the week that it broke out there was declining volume. That means the professionals were not buying then. The professionals were standing back, and that price move was caused by the amateurs coming in and buying it as they saw the breakout from the previous red arrow from that dotted line. 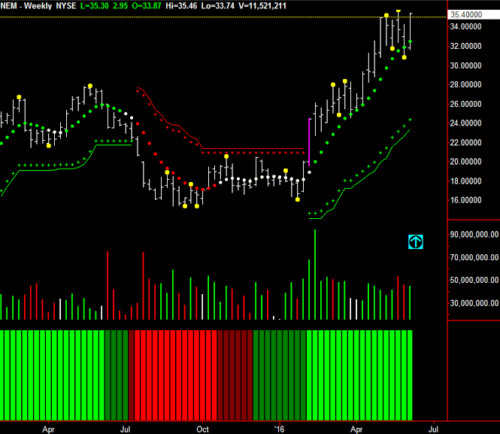 But we, as Hawkeye traders, know that we have to have a trend in volume to make markets move. So, with a bit of forensic analysis (as I like to call it), you can see that the market didn’t break-out. 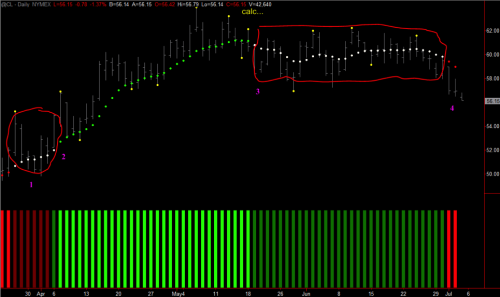 And, in fact, this week it has closed back inside the range of the original dotted line, so that resistance is there. We now have a new isolated high and isolated low and the markets are going to unfold. We do need to see more volume coming in to get this as a move up. Now, the next chart I want to look at is gold. As a backdrop, there is something very interesting and fundamental going on at the moment. What I’m talking about is that several countries throughout Europe, including Austria, Holland, Germany, and Switzerland are bringing their gold reserves back from outside of their countries. Could this be the start of eventually going back to a gold standard? It’s certainly very possible. 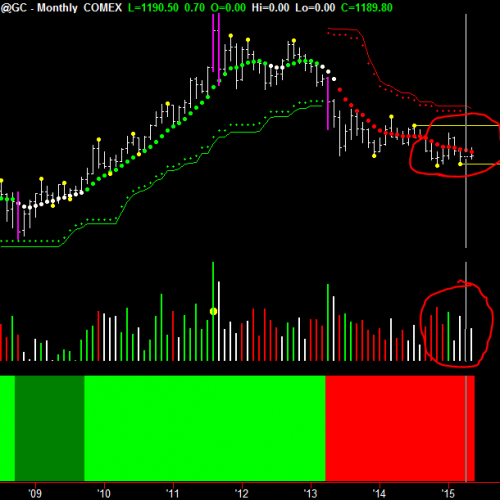 So, with that in mind, let’s go have a look at the monthly chart of gold first. 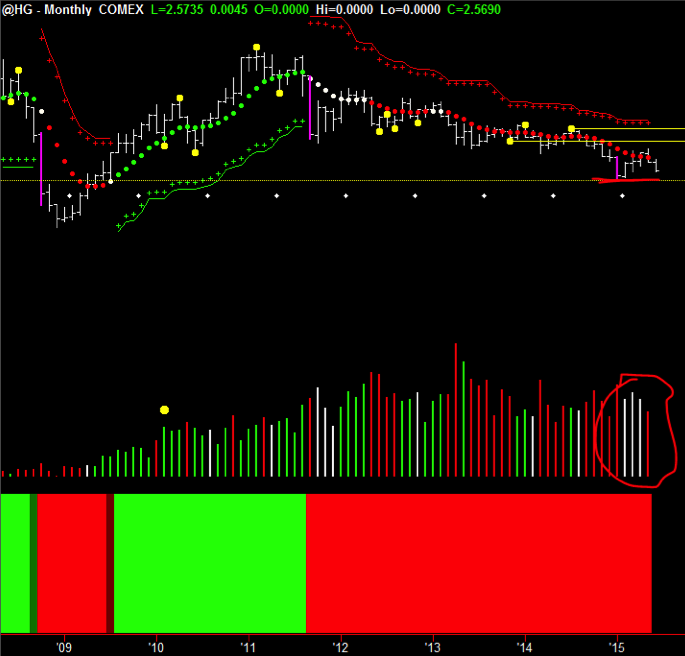 I have circled the volume on the monthly chart down at the bottom. And, you can see that it is totally distribution and accumulation volume that you can see at the bottom of this down move. For example, can see it has been red, red, green, white, white, white, white – i.e. no demand. But the market hasn’t moved down. If you look at the price, you can see that we have two isolated lows forming a bottom, where the circle is on the price. And, the price is going sideways. So, let’s see what happens with that chart as the months roll out. 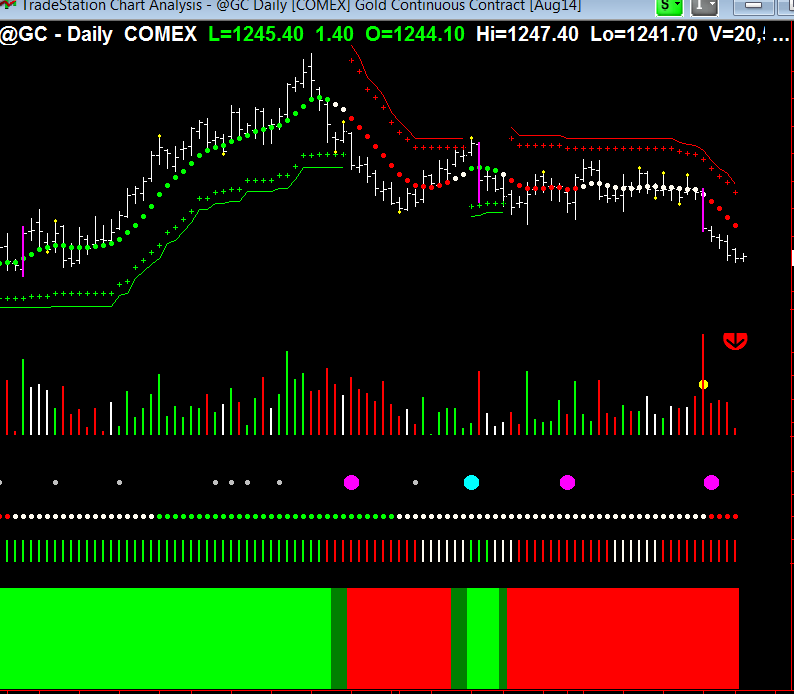 Now let’s go have a look at gold weekly . . . Here, you can see on the gold weekly that I have circled the volume again. 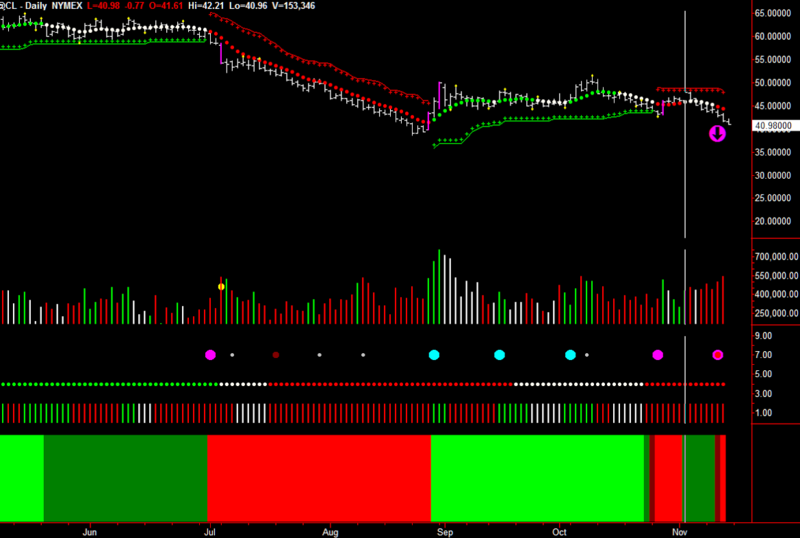 This is classic accumulation volume (red, green, red, green, no demand). And again, if you look at the price, you can see that the market is going side-ways. For example, look at the flat Hawkeye Trend dots and all the isolated highs and lows. Certainly, this is a market that it is in accumulation. So now, let’s move to the daily chart. Although this is in an up-trend, look at what has happened. 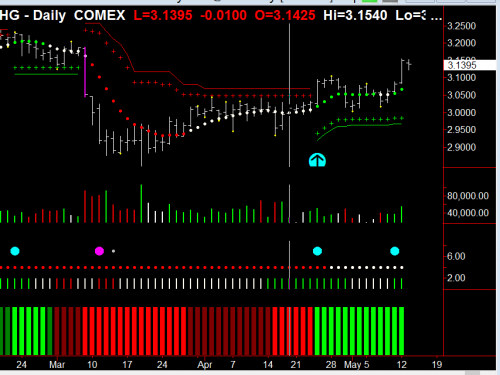 You can see where I have circled the volume at the bottom, how the Heat Map (the bottom indicator on the chart) is dark green, showing us that the bias is still on the up-side. 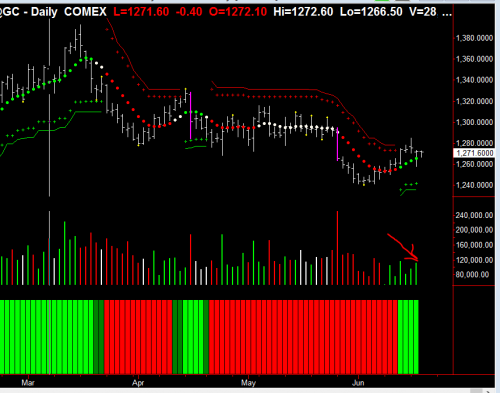 But, for the last ten days, we have had red volume, which means that selling volume is coming in to this market. But, the market hasn’t gone down. It has just gone side-ways. It came down to where I placed the cyan arrow, where it virtually touched the Hawkeye Stops (which as we know always act as support and resistance) and placed a phantom isolated low where the cyan arrow is. So, we should expect this to be a low pushing it up. Undoubtedly, this market is highly oversold and one would be expecting a decent rally to be coming in to gold at some stage over the next months. So, make sure you look out for this, and definitely have it on your radar. 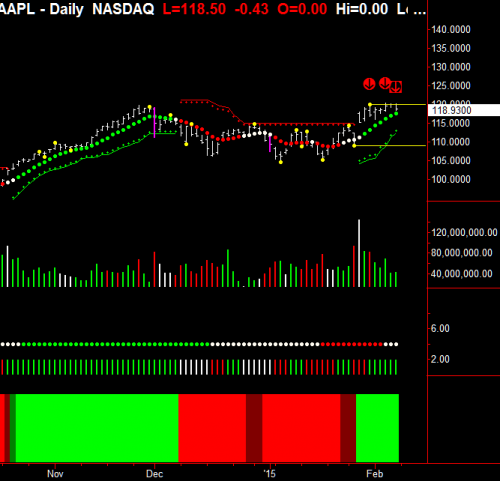 Apple: A Screaming Buy or an Overripe Fruit Ready To Fall? Last week, Apple reported its cash reserves had grown to $178 billion, due to phenomenal sales (74.5 million) of the latest iPhone 6. This massive cash reserve is larger than the total market value of Pepsi, Disney, or Amazon. They also reported the biggest quarterly profit ever for a public company – $18 billion in net income in the last quarter of 2014. Because of this, the financial news analysts are virtually tripping over themselves with predictions of Apple’s stock price soaring to $140 and above. Activist investor Carl Icahn, who owned 45 million shares of Apple as of last August, claims that the stock could be worth over $203 per share! Knowing, as we do, that Volume is the only leading indicator, let’s take a look at what the Hawkeye indicators are telling us about the future of Apple’s stock price. 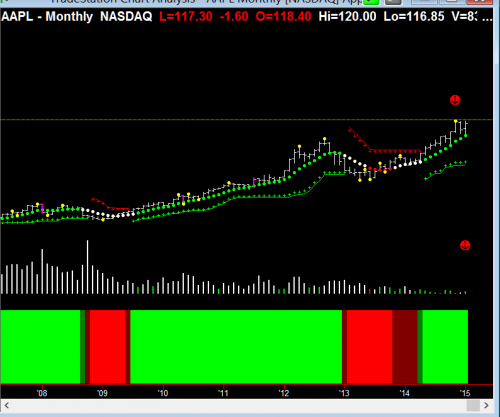 Let’s begin with the monthly chart below. As you can see, I’ve put two arrows on the chart, one at the top, and the other at the bottom. The arrow at the top is pointing at the Hawkeye High Pivot. And you’ll also notice I’ve draw drawn a line across that point, showing you where the price must close above, by the month, to show it is still in this up trend. 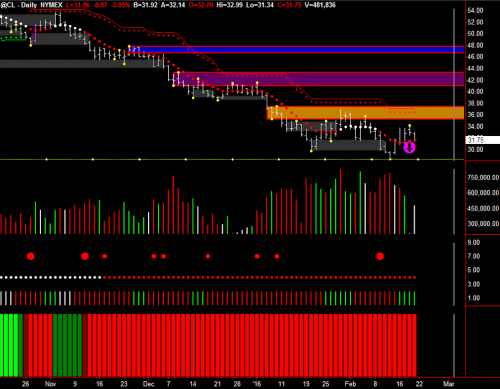 At the moment, we see it’s stalling out at that level, which is showing resistance. Now, let’s focus on the second red arrow down below. 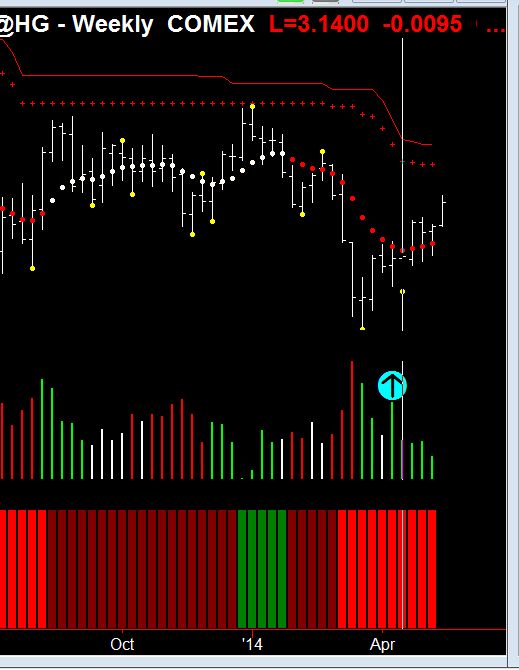 This is showing there’s declining volume in this up move. So, the Hawkeye indicators are telling us not to expect the explosive move to the upside all the pundits on the TV are talking about. However, if there is a close above the line I’ve drawn at the Hawkeye Pivot point (which is at 120), then all bets are off, and Apple could be off to the races. Now, let’s look at the weekly chart below. 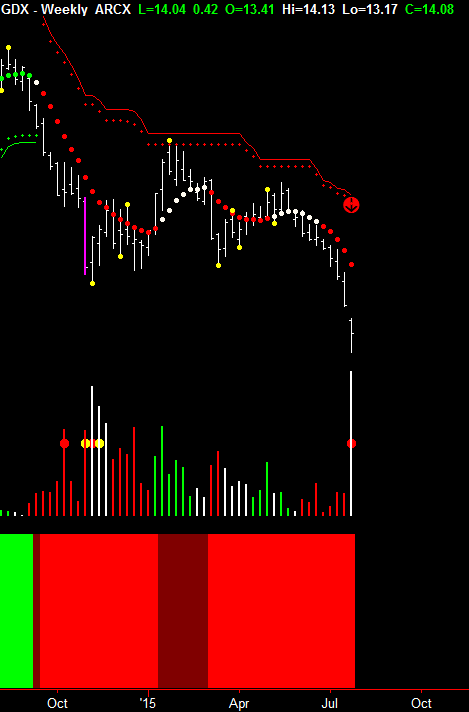 I have drawn a line, to show you where that weekly pivot is holding. You’ll also notice the pivot was just hit (where I’ve placed the cyan arrow). 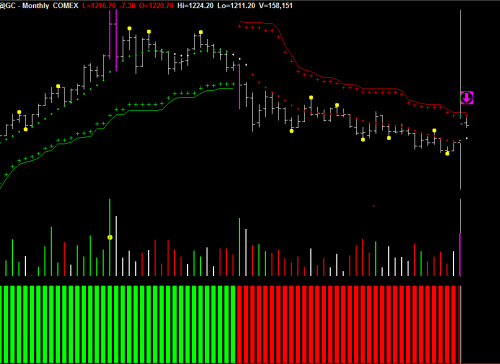 See how this occurred on high volume and that the Hawkeye Volume Radar indicator marked the event with a yellow dot? However, if we look at the range of the bar, there should have been a lot more volume to go into that to push it up through that line resistance. So, yes, there was a lot of good news about their cash reserves , but you can see that the price went up and hit its resistance level and retreated from that line. Now, let’s look at the daily chart below. Again, you can see the resistance I’ve marked with the line. But, if we look at the volume on the daily chart, you can see that we have a typical topping volume profile, where we have red volume, no demand volume, a little bit of buying volume, and then selling volume. So, all of this is showing that it’s going to be a defining week coming up to get Apple through 120. 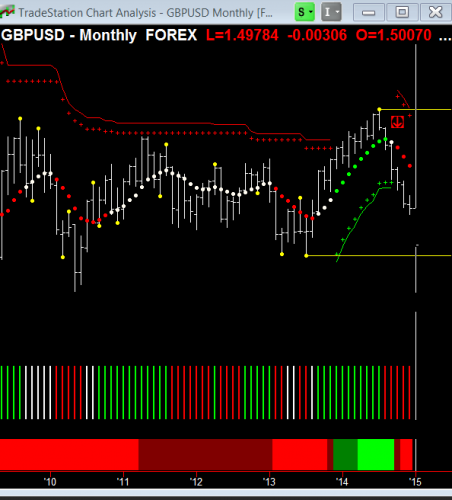 In today’s issue of our newsletter, I’ll show how the Hawkeye indicators can be used for trading the British pound against the US dollar. Let’s begin by looking at the monthly chart. 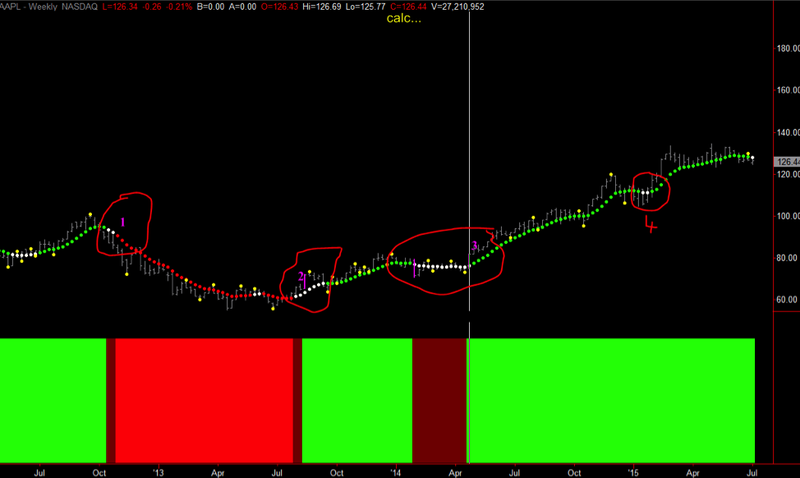 As you can see, the monthly trend dots have gone red, as illustrated by the red arrow I’ve placed on the chart. 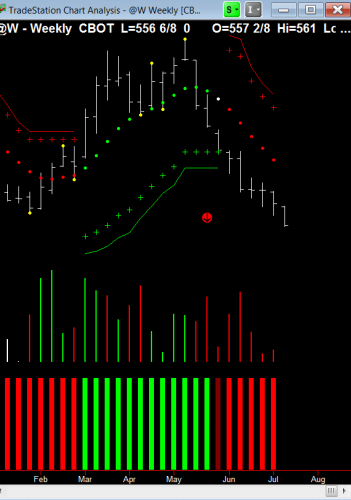 You’ll also note that the volume indicators and the heatmap are all red. Now, let’s look at the last pivot low. That’s indicated by the yellow dot and horizontal line. If prices break below that, it indicates we will be in a serious down trend. Looking back to May of 2010, we see the previous low was at 14229. So, if this current trend were to close down through the current pivot low, we very well may be headed down towards 14229. Now, let’s move on to the weekly chart. 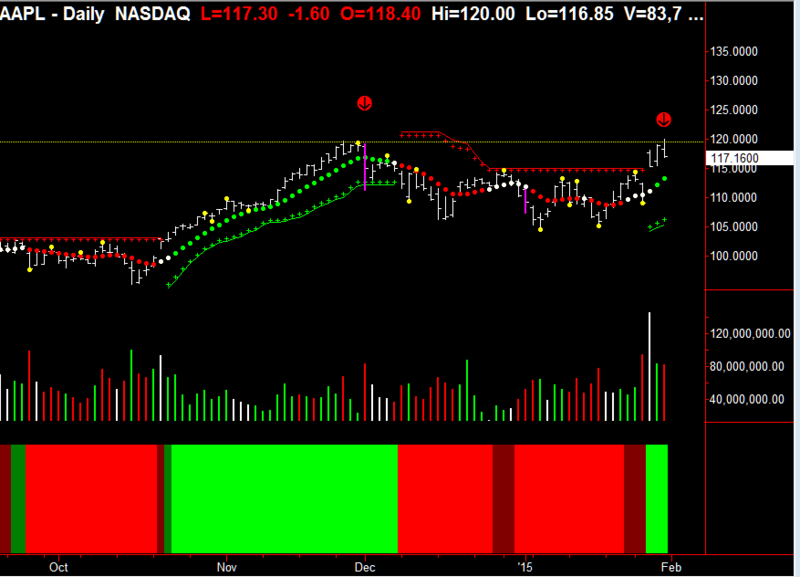 As you can see, the weekly chart has broken down from where I’ve placed the red arrow. You can see that prices have closed down below the pivot low point. Also, notice the evenness between the trend dots in this down trend. This indicates there is substantial momentum to the down side. Finally, on the daily chart, you can see we’ve just now broken down below the Hawkeye pivot low (the yellow dot with the horizontal lines extending out). 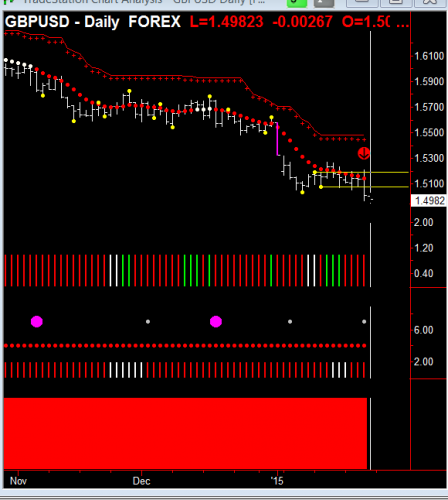 We see that the GBP held prices within the pivot area for a few days. However, on Thursday, the 22nd of January, we saw the price close down under the pivot, and so we’re now in commencement of a re-entry to the downside (You’ll also note that the Hawkeye Roadkill indicator put in an aggressive entry to the downside). 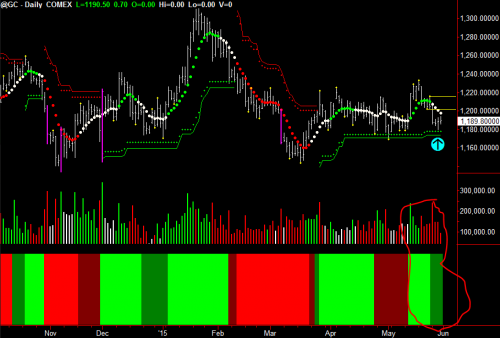 So, the Hawkeye indicators are telling us that it looks like serious weakness for the GPB. I would expect it to continue on down now, and certainly, given all the evidence we see from the Hawkeye indicators, it’s a great shorting opportunity. But, make sure you do not go long on this if you’re trading the faster time frames. 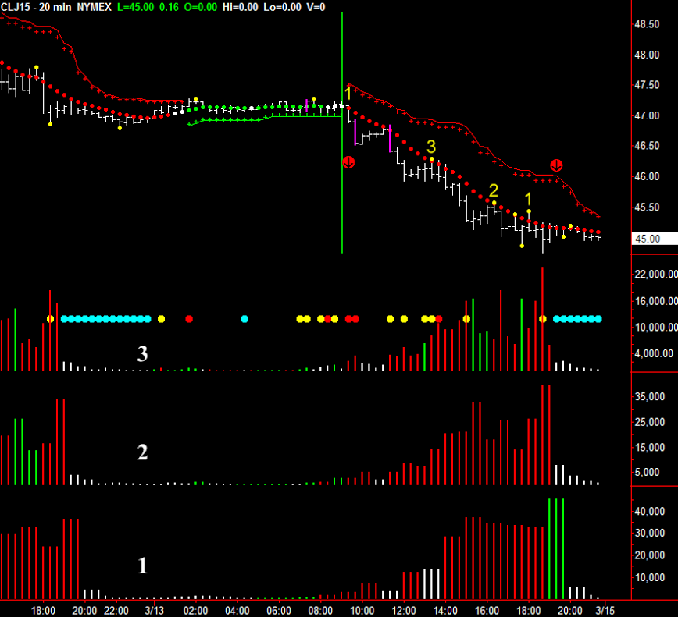 Only trade in the direction of the slower time frames! So, I hope you’ve enjoyed seeing how we use the Hawkeye Pivots. 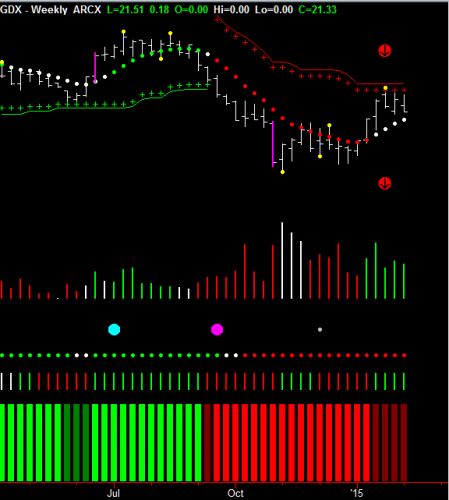 Understanding price action with the underlying Volume is the true advantage in trading, and the Hawkeye Pivots is a unique tool that helps us put it all together. In today’s article, I’ll show you how we use the Hawkeye Pivots on crude oil charts to illustrate their value to enhance your trading. If you look at the right side of the monthly chart above, you’ll see there’s a red arrow pointing down. 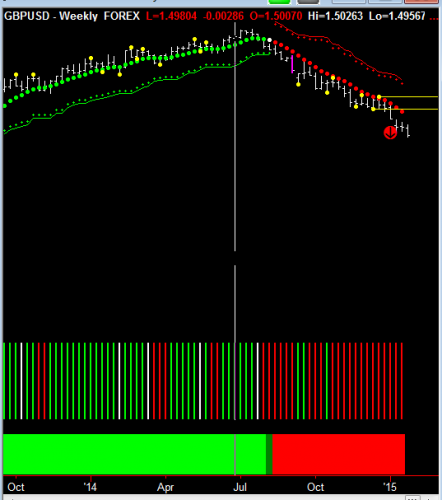 While not part of our software, the red arrow shows the first time price closed under the pivot low extension (that’s the yellow line that’s coming off the last true isolated low). 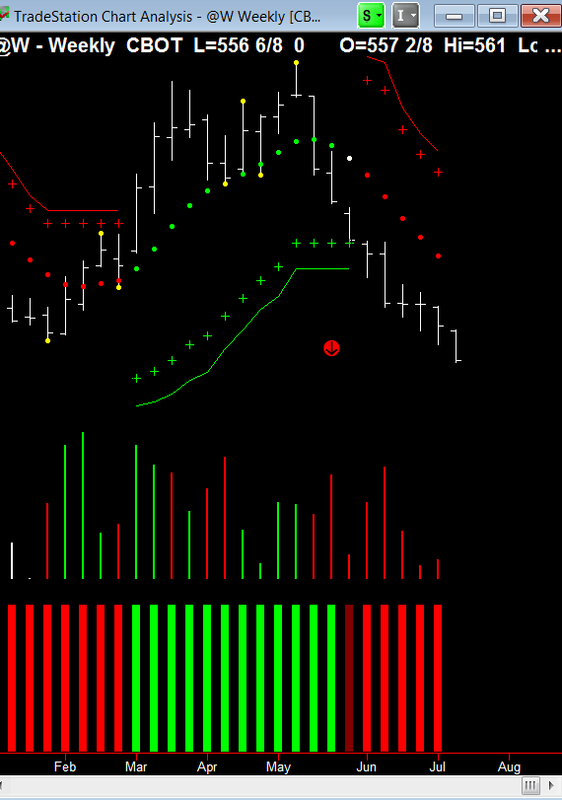 This breakout was on the 31st of October 2014, and Hawkeye showed the new trend has commenced with red selling Volume, a bright red Heatmap, and declining red Trend dots. 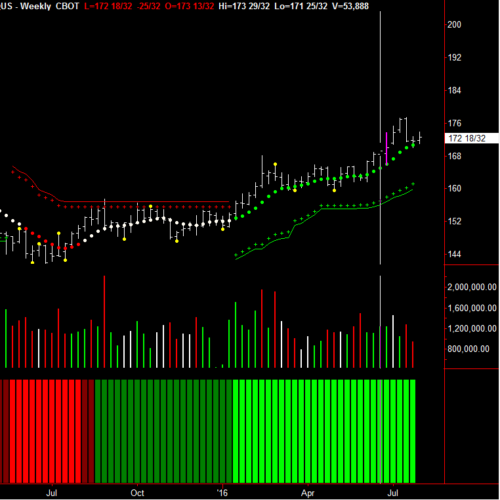 Now, let’s look at the weekly chart. Notice where the red arrow is again. 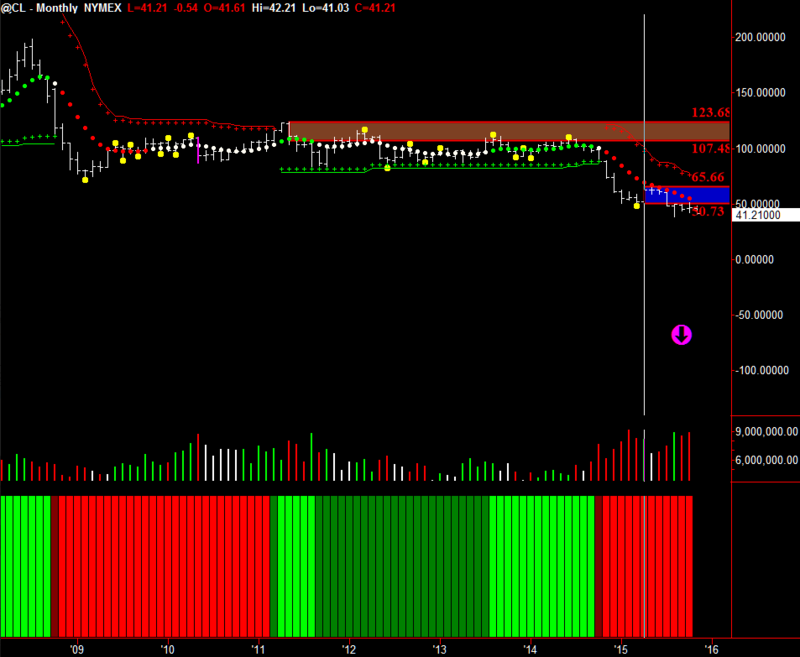 That is where the breakout occurred, when price closed under the last isolated low pivot extension. 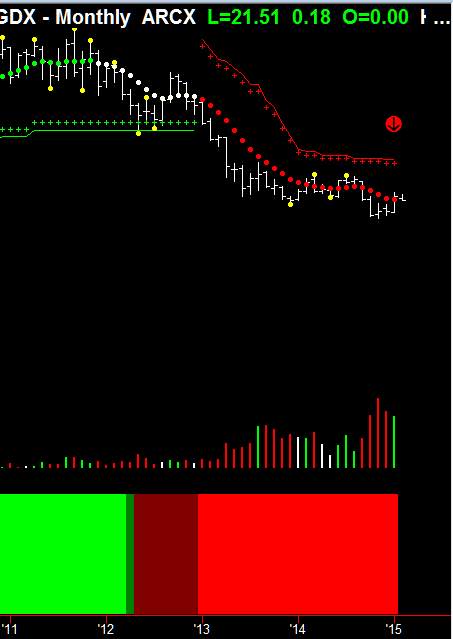 From there, you can see that the prices are falling and that no pivot has formed all the way down. However, now we are getting to a potential pivot low, and you can see some green buying volume has come in on the weekly chart on the last bar. Keep that in mind as we now move on to the daily chart. Here, you can see I have placed a cyan arrow pointing upwards showing us the new pivots and the extension lines (high and low), which are the two yellow lines extending to the right. 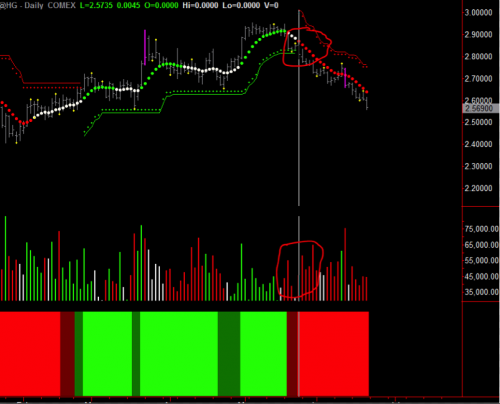 Notice that the trend dot has gone flat, that the price is going sideways, and that the volume is declining. 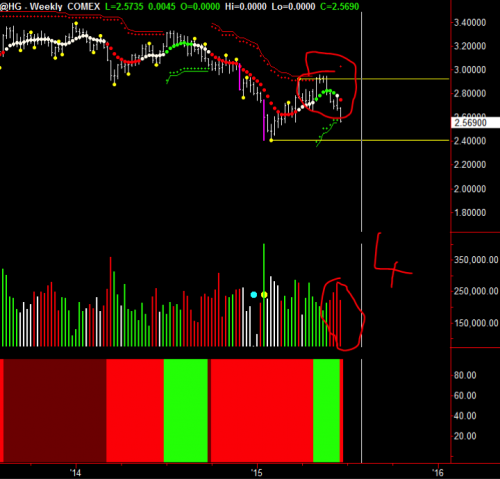 Now, notice how on the Roadkill indicator we see two bars of green buying volume coming in. That means, we are hitting a point of congestion on our crude chart. Whether it will continue down, we will only know if that pivot low is taken out, and that price is at 4455. 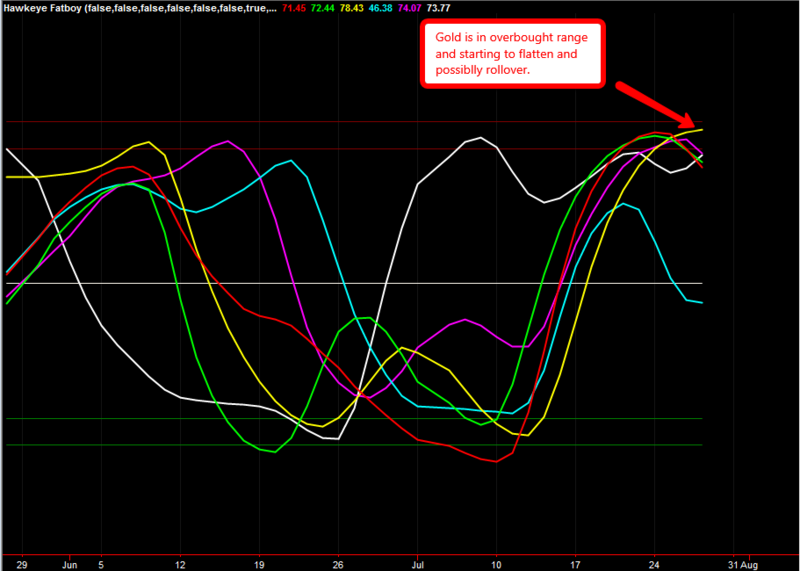 Therefore, if we close below the pivot low at 4450, then the downtrend will resume. But, if the pivot high is taken out, which is at 5175, then we will be in a daily uptrend. The bias at the moment is still down, but we are getting congestion bottoms forming, hinting that upwards price action is a possibility. A few weeks ago I told you that it was looking like a critical few weeks for gold trading. I showed you how Hawkeye showed the weakness in the current downtrend, and I showed you what to look for as the first signs of a new up trend. 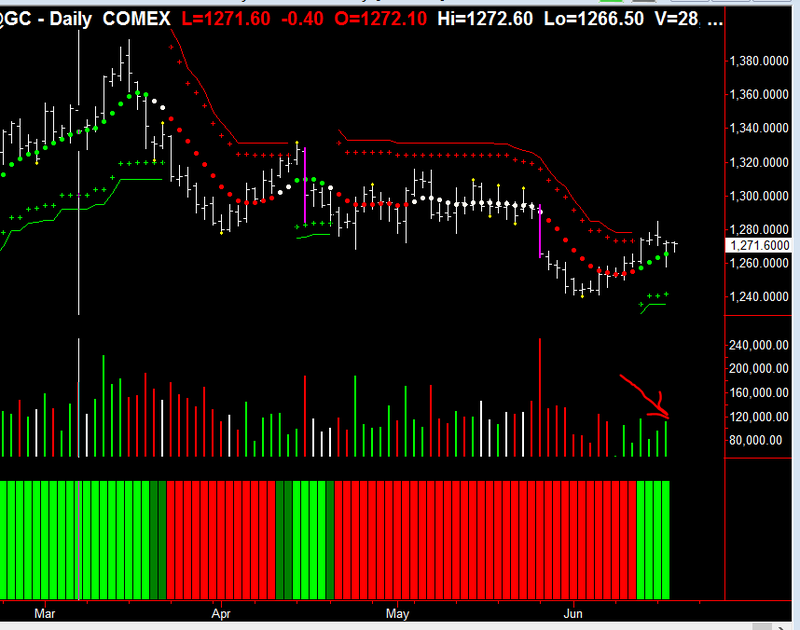 The weekly Hawkeye stops held (support) and now Hawkeye Volume is showing that buyers are returning to the table, accumulating Gold at these low prices. Hawkeye showed you where the smart money was! 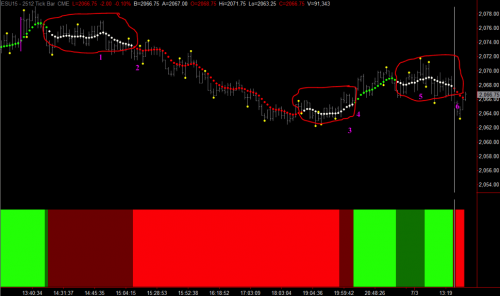 Hawkeye Gold is now going through accumulation (indicated by the red arrow). 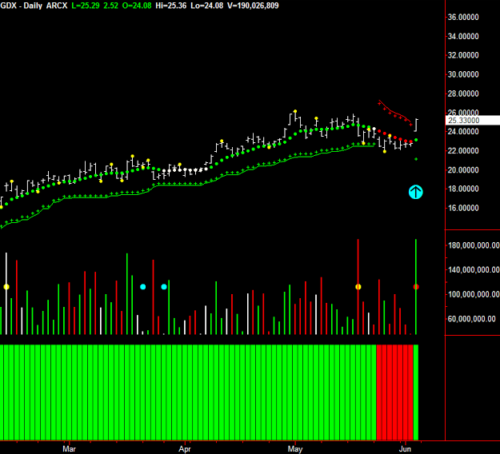 Do wait until there is break out on high volume through the high that occurred 2 days ago. This could be the commencement of a major trend, so a great deal of patience is in order here. 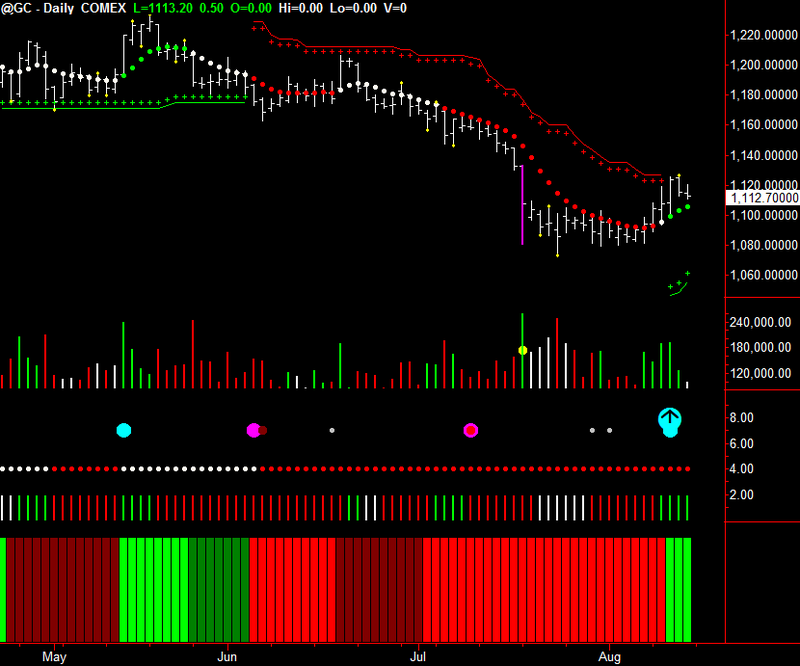 GDX is an ETF of gold mining stocks, a forerunner of the gold price. Accumulation has taken place (indicated by the red line) and price move has commenced, especially when the last Hawkeye pivot (the yellow dot on the price to the left) is taken out. Gold is now at a pivotal point, with the bias to the upside. 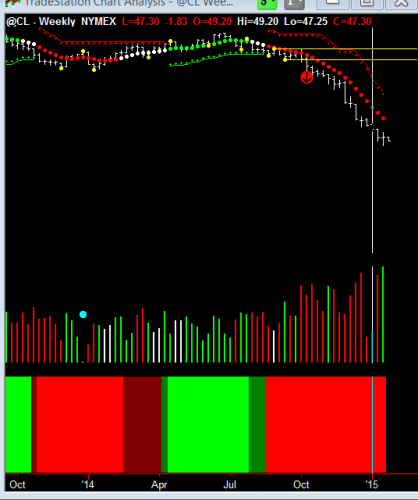 Both Hawkeye pivots to the left on Gold and GDX have to be taken out to confirm the uptrend. But let’s look at Hawkeye Gold. 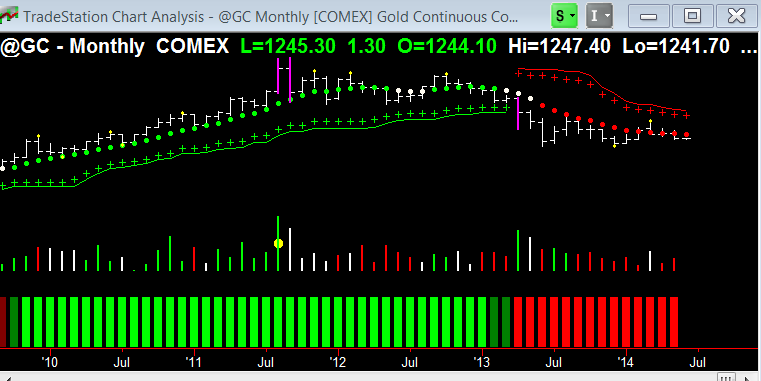 The Gold Monthly Chart is in a down trend bias but in congestion. On the Gold Weekly Chart we are at a critical point. 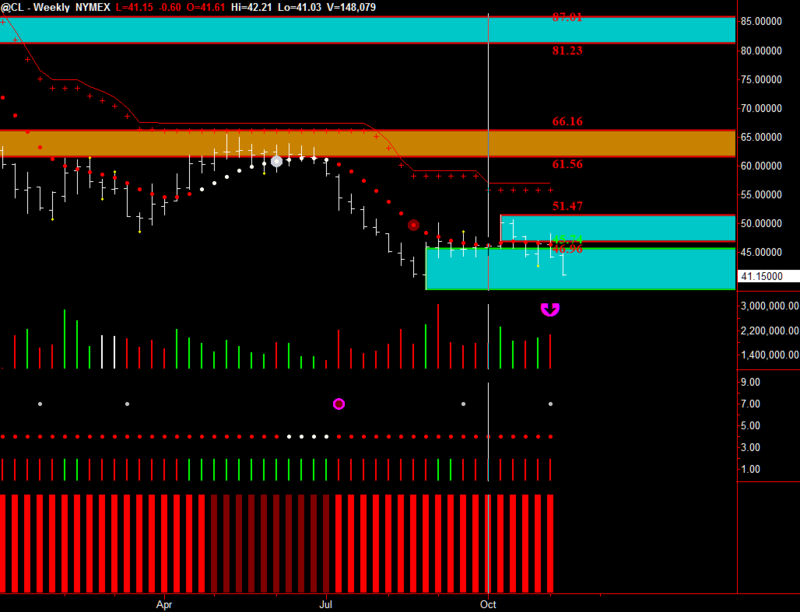 The price is hitting against the weekly stops which act as a support (indicated by the red arrow). Remember what W.D.Gann said – price usually goes through support resistance at the 4th attempt, if it does not hold it will be the commencement of weekly down trend. 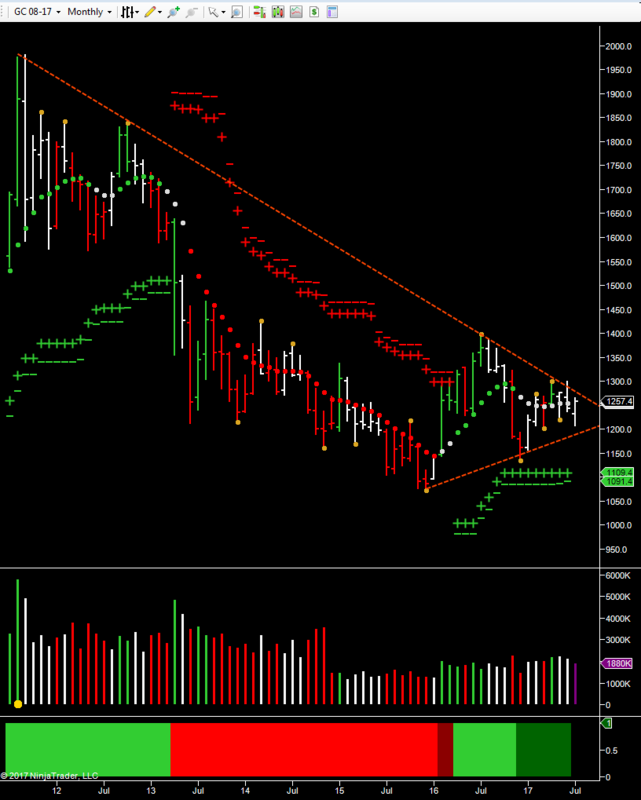 The Gold Daily Chart is in a down trend. 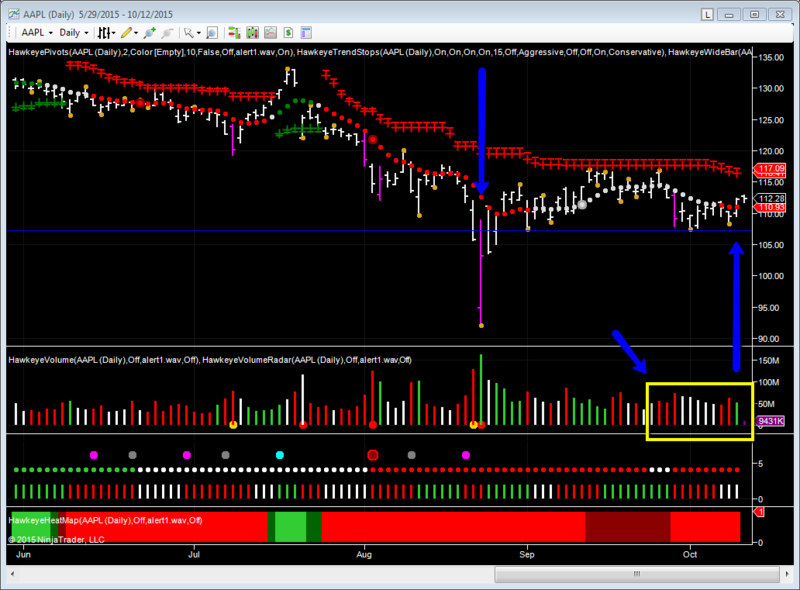 However, there are narrow bars on declining volume (indicated by the red arrow). This is usually the first sign of congestion and accumulation prior to a new up trend. We are at the crossroads here. 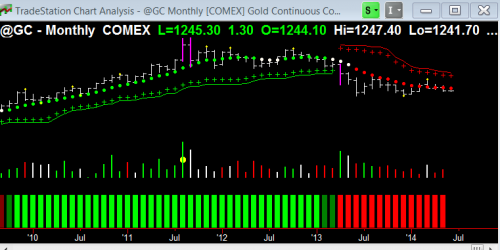 The Gold price needs to hold on the Weekly Chart, and then you will see the Hawkeye Volume indicator start showing some green volume bars as the majors start accumulating Gold at these low prices, before the trend runs up. But wait – Hawkeye will show where the smart money is. This week I want to show you how copper is demonstrating that the world is coming out of recession and how this vital component in all building, electrical and industrial production is being bought. 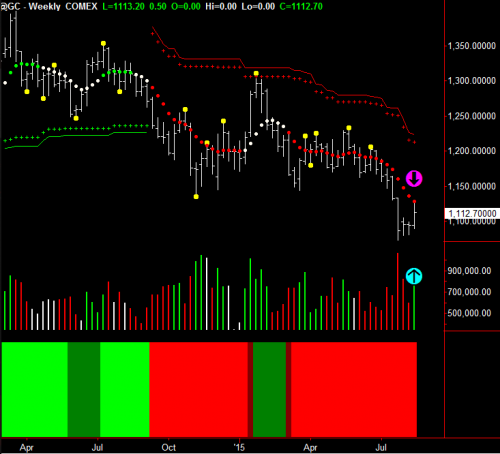 Since March 21, copper has been in accumulation mode. 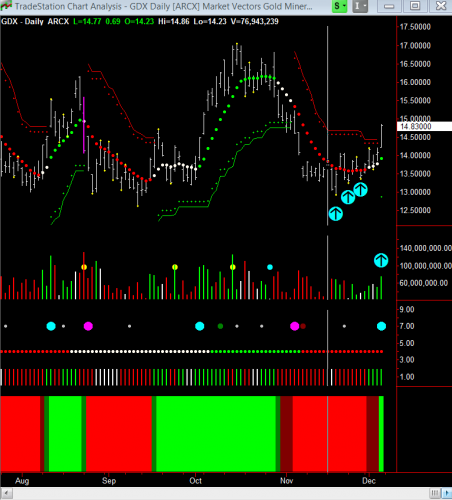 You can see 8 weeks of buying as major buyers step in and commence accumulation (indicated by the cyan arrow up and the green Hawkeye Volume bars). On April 24, Hawkeye gives an entry signal (indicated by the cyan arrow). 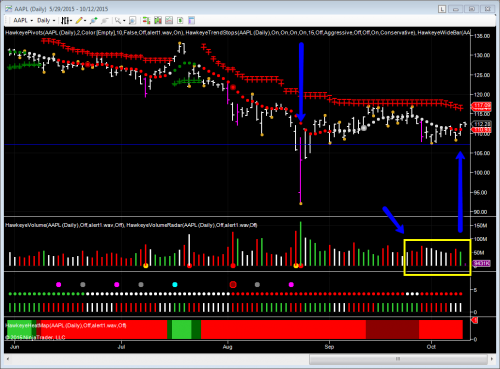 All trends and volume now in place – this market has been accumulated. The next phase is a price move up until demand is fulfilled. All conditions are in place for copper to work its way higher. Remember, trends rarely go straight up, but zig-zag to higher price levels. But there is little downside risk at the moment.